Easter is April 20, 2014. Enjoy the bingo specials in April! 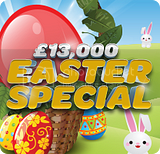 £13,000 Easter Special Forget chocolate eggs, Sun Bingo has the ultimate gift for you this Easter with a £13,000 Special Game on Friday April 18 at 9:45pm. You could win £1,000 for one line, £2,000 for two lines and a huge £10,000 for a Full House! This April they have some extra special Easter themed goodies up for grabs! Cards are just 10p each and you can play Online, on your Mobile or Tablet! 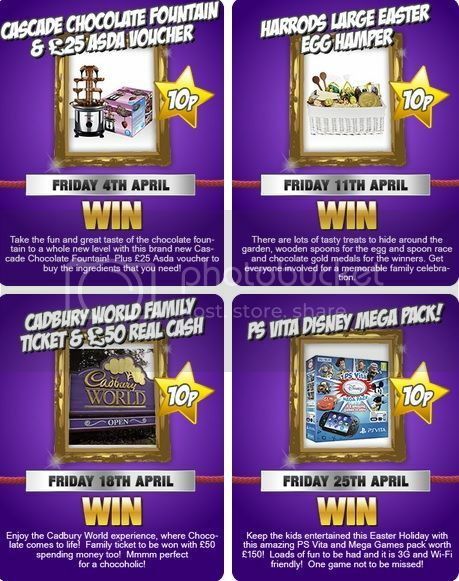 There will be a Cascade Chocolate Fountain & £25 Asda Voucher, Cadbury World Family ticket, PS Vita to be won plus more! Get you cards now and don’t miss out on these top prizes at Sing Bingo! Earn free tickets to Easter Jackpot Game! For every £10 deposit made, you will earn and tally a single bingo point on the Easter Jackpot leader board. Earning points is the key to victory in this tourney so make sure you try and collect as many as you can. The top 3 players to accumulate the most points between 11am Friday 4th and midnight Thursday 10th April 2014 will bag one of the following Free Ticket prizes. everything is NO USA,whats up ? To play Easter Raffle register for their FREE SMS game in 'my account'. If you've opted into the Heist you're already registered to play Easter Raffle. Opt in by Mon 14th April. Play and win in the special E-A-S-T-E-R patterns with guaranteed $25 prizes playing in the Green (Quarters) Room. Win 3 Happy Easter patterns in a day and win 10 BBs Extra! Important: To collect 10 BBs, please note the Game IDs of the HAPPY EASTER patterns you won and bring it to Live Help. How many Easter eggs does your bunny has in his basket? B stands for Bunny and O stands for Easter eggs! Choose a bunny from the B column and give it to the chat host before the game begins. Now as the game begins, your bunny hops to reach the corresponding Easter egg in the O column. At the end of 2 hour session, top 3 bunnies to basket maximum Easter Eggs by the end of the session will win you 10 BBs each! Play every Thursday in the Red (Nickels) Room. Plus the Easter bunny will go hippity, hoppity in the chat rooms so don't forget to hop in into the chat room and get your share of chat BBs! 7 guaranteed jackpots a day!